First, I’ve stopped bothering to pre-sort my laundry into knitted things and non-knitted things. I realized that what would happen is that I would shove the non-knitted (i.e. “regular”) laundry into the washing machine first, and then by the time it came around to deal with the knitted stuff it was all too easy to get lazy and post-pone it another week. Which you can get away with, of course, if you’ve got enough socks and sweaters, but it does pile up. Instead I sort things at the time of doing the laundry, and knitted things get put into the sink with a dose of Soakwash or Eucalan. The nice thing about Soak and similar products is that they are intended to be used literally to soak your knitted things. You don’t need to wash and rinse, you really do just squeeze it into the sink (or tub, depending on how much you’re washing) and let it foam up, and dunk your sweaters and socks in and let them sit for a bit. Then you drain the sink and squeeze out the water. Once I’ve squeezed out as much of the water as I possibly can, I let the items air dry on a drying rack in the laundry area. For sweaters I lay them as flat as I can. I really do need to up my game on this, and I’m embarrassed to admit that it was only just last year I learned that such sweater drying systems as this one exist in the world, and now I want one. Waiting for the stuff to dry still takes a day or two, but again, at least I’ve got backup stuff to wear. 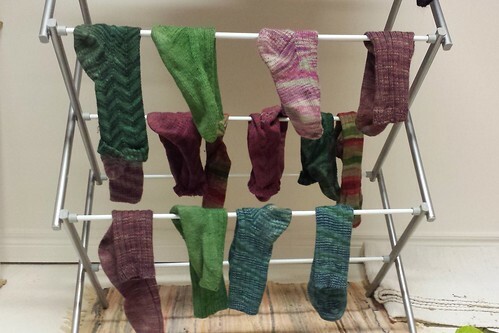 I did used to save up all my socks and run them with my other delicates in the washing machine on the delicates cycle, but I found that they started to felt a little bit over time, and my attrition rate of handknit socks went up too quickly for my liking so I stopped doing that. Your mileage may vary, of course, but after a few mishaps with washing machines over time, I’ve stopped using them for my handknits if I can at all help it. Related to this is, of course, the issue of ‘pilling’, and I wrote a post about that a couple of years ago that you might find useful if this is the first time you’ve happened upon this issue. Rest assured that you will most likely encounter pilling on your garments the more you wear them, and that even if you are very gentle and careful and methodical about your washing, the pilling will still happen – probably in the same places on the same kinds of garments. It’s not even necessarily a result of how good the yarn is, but just a fact of life when it comes to wearing things. Your commercial knits will pill too. If I’m really in a bind and I need something to dry fast (like if I’m sending off a design sample for a deadline), I will lay it out on blocking mats in front of a fan overnight and that usually takes care of it. But if I can help it I like things to air dry. Do you have favourite tools or tips for washing your knits? If you’ve ever had a mishap, no doubt you’ve ended up with quite a few best practices of your own through learned experience – it’s a badge of knitter honour. I like rolling up my knits in a towel to squeeze out the extra water before laying them flat. I use a fan, too, to speed things up. With sweaters or things that are two layers thick once you lay them out I’ll flip them over after a few hours so they dry a little faster. I find that if I put my wet woolens into the washer on the end of the spin cycle (like using a salad spinner to get out the extra water) and let it run for a minute or two they dry much faster. I use Eucalan for the soaking part, pour out most of the water, drop the woolens into the washer and put on the spin. My husband’s heavy socks (wool and alpaca) dry within a day instead of the 3 or 4 days they would take when I used the squeeze in a towel method. All the woolens are laid flat on a mesh drying rack (like the one you mention) and dry quickly. My front loader has a rinse and spin cycle that uses cold water. This works great to get rid of the excess water. Great tips on the Soakwash and Eucalan. I, too, use the drying rack and flip after a few hours. Sometimes I’ll even flip the item inside out (depending what it is) after a few hours to help speed up drying. This is such a “keeper” post! Thank you! I use Eucalan then lay socks and sweaters on a towel to dry. I wash like colors of socks with like – three pairs of blue socks, two of red. I suppose I could wash them all together but sorting by color seems safer. I am forwarding your wash day post to everyone I knit for this Christmas. Thank you! If it’s just a few socks to wash they go in the sink to soak while I have a bath. Or if there’s a good few I’ll do them in the kitchen sink and then spin them in a laundry bag. Jumpers get similar treatment, mostly get hung on the radiator (though really brightly coloured socks can leave coloured marks, so I’ve started putting them on a towel first! That sweater dryer is the bees knees, and not very spendy, either! Susan in the first comment hit most of my highlights: rolling knits in a towel (I like to walk on mine to squeeze water out), flipping things over as they dry. I saw a cool idea recently for cowls: putting a pvc pipe at the ends so you don’t get a crease. Sorry I can’t remember the source. As my kids wear lots of handknits, I just toss them into a bucket & when the bucket is full I then fill it with warm/tepid water with a bit of wool wash to it & let it soak over night. The next day, I squish my hands into the bucket, sort of rotating them a bit then tip the bucket into the bathtub & wring the water out of them and lay them on the clothes airer to dry. I have always washed the clothes this way, the soaking overnight loosens the pureed pumpkin & ground in toast etc – really easy to wash. I do many of the things others have written about. In addition, I keep a “mini basket” inside the door of my closet. My socks go in there as I take them out, so I don’t have to sort for laundry. Sorry about the typo: make that take my socks OFF (not out). I’ve been wearing hand-knit socks for years now, and I’ve only had a couple of pairs show wear – I have a good front loader with a very gentle delicate cycle, and I was everything on cold any. Then I just hang the socks on an octopus shaped hanger that takes care of eight pairs, and they dry in the bathroom by the next morning. Yes there is a very slight bit of felting on the soles, but I suspect that is more from the wear than from the washer. I’m trying not to feel too guilty for my somewhat cavalier approach, but it works for me. I use a lingerie bag for when I have to throw my socks into the washer. All my other knits get hand washed. The bag works great for me – they reduce friction enough that I’ve never noticed any undue pilling except from normal wearing. I also keep a bucket for my knits next to my regular laundry hamper. I’ve heard too many horror stories about helpful hubbies accidentally ruining things by trying to do a load of laundry! Real life. I hate doing laundry. Knitted and non-knitted. One advantage to Calgary’s dry climate I guess: socks dry in hours! Never occurred to me you could dry socks draped over like that – I always lay them out on a towel to dry, which does take an annoying amount of time. Thank you for the visual! My washing machine has a 30°C wool cycle and a cold handwash cycle. I mostly use the handwash cycle for my handknits, the ones I knit for my daughter (from sturdier yarns) go into the 30°C wool cycle. I use Eucalan to wash them. All items are put into a laundry net before they go into the machine, so they can’t snag on anything. The cycle comes with a 800 rotations spin, and after that, they go into the dryer for 5 minutes (they dryer has a wool finish cycle). Then I lay them flat on a clothes rack, and they are usually dry the next day. (ctd from above) and have to endure the regular 30°C cycle. But they do quite well in there. I mostly air out my sweaters after wearing them by putting them outside on a clothes rack – that way, they get refreshed, and I only really need to wash them a few times a year. Thank you so much for this article! I love knitting and have wondered how others deal with washing items knit from natural fibres. The pilling article was excellent and I learned a lot. Thanks again! I, like streepie, wash almost all of my handknits in the machine on the wool wash cycle, but I use,an organic liquid detergent such as Seventh Generation, using approximately half the called for amount. I have never once lost a sweater to this process. After they have spun dry, I usually dry them flat on childrens playmats (which I also use for blocking) so that I can reshape the. If the wool is particularly stretchy, I will give it five minutes in the dryer. Socks go in with my regular wash on permanent press, and the dryer too. If they can’t live with that, they don’t fit in with my lifestyle. Many of my handknit socks are 5 years old, or more, so its working pretty well. My socks started to felt in the machine on the delicate cycle using cold water, so I’m looking for another routine. I think the bucket next to the laundry bins, and then fill it to soak using Eucalan or Soak is probably the route I’ll go. If it could slide in above the dryer with enough space to fit the drying items still on it, that would be awesome! I’d use it all the time. I have hand knit socks that have been machine washed and they are still going strong. Very little if any felting. I guess I got lucky. My hand knit socks don’t get much use anymore as i am not working full time so they stay in their appointed drawer. My husband uses his everyday now that he has given up on store bought. The last pair of those he got just last year and they have holes in them!! I have to make more for him and quickly! Now that i have the time to knit him more socks, I will fill up his drawer and begin hand washing. CT is expensive power wise and we have to stop using electricity as often as we do. I use a Dish Drying Mat (Bed, Bath and Beyond) that holds four times it’s weight in water. Roll up two pair of socks (it’s a pretty small mat) and step on it a couple of times and the socks are almost dry when you unroll the mat. Drape over the back of a chair, shower curtain rod, etc. and they are always dry by morning. I need one of those drying racks! I’ve recently started spinning and was thinking I could also dry locks after they’ve been soaked using that. 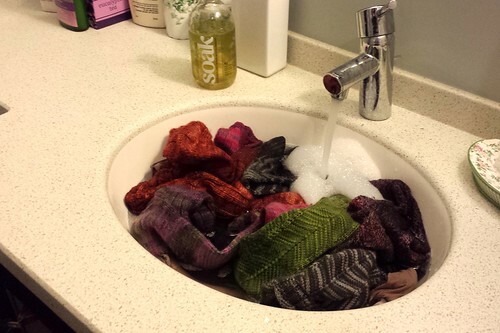 Since I get weirded out about washing my knits in the sink (what if I missed some toothpaste somewhere!) I like using my top-loading washing machine. I set it to soak so it fills with warm water, squeeze in some eucalan, and drop my knits in and let them sit for 20 min or so. Then I put my machine on the spin cycle (which does not rinse, apparently some machines do) to drain away the water. I hang them on a rack like yours near the hot water heater, which is the warmest room in the house. I might need to get myself some of that Soak! I put one or two sweaters in my front-loader on the handwash cycle with each one in a lingerie bag or pillowcase. They almost always have to be rolled in a towel to get out the extra water, and now that I no longer live in Arizona, I have to leave them laying flat with the overhead fan on to get them dry in less than 24 hours. My 2-year-old loves to help wash my hand knit socks. Perhaps I should hire him out. I fill the sink with warm water and Eucalan and then he gently drops the socks in one by one and watches them sink into the water. Potential disaster – a pair of handknits in the wash with my husband’s underwear – hot water, bleach, then dryer. Guess what, no noticeable damage. Not recommending this, but cudoes to Zauberball yarn.